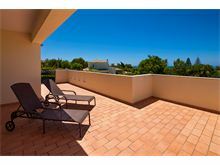 Casa Almajero enjoys an enviable situation close to the village centre and delightful beaches, yet is set in substantial grounds with beautiful lawns and landscaped gardens offering plenty of space and comfort. A modern property, with a fantastic raised covered terrace overlooking the grounds and the pool below, perfect for evening barbecues and lunches in the shade, out of the hot summer sun. Vale do Covo beach is the nearest cove, less than 1.5kms away, complete with beach bar and a dramatic cliff back drop and can be reached on foot in 20 minutes. Carvoeiro village centre with its varied choice of bars and restaurants is also reachable on foot making Almajero perfect for those who do not wish to be totally reliant on a hire car during their stay. The interior is tastefully furnished throughout with four comfortable bedrooms and a modern kitchen and spacious open plan living dining area leading on to the covered terrace. 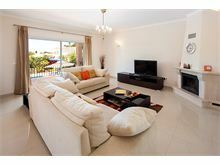 Approximately 1.5 kms from the beach, shops and restaurants. Entrance hall, guest cloakroom with external doors so also serves as a pool cloakroom, modern kitchen with dishwasher, microwave and washing machine, sitting room with wide screen TV, iPod docking station and dining area. French windows lead out to a covered terrace overlooking the pool and garden with built in barbecue and pool shower. 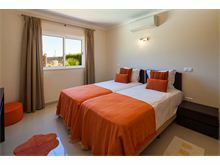 1 double bedroom with doors to an open terrace and 1 twin bedroom share a full bathroom. Upstairs to 1 twin bedroom with bathroom en suite and doors to a balcony with sea views, master double bedroom with shower room en suite, dressing room and doors to a covered terrace with sea views. Maid service 2 times per week. Air conditioning is available at additional cost, if required. 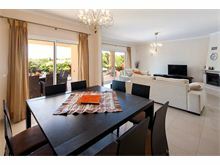 This was the second year in a row that we have booked with Affinity Villas and again the service was excellent from searching the website through to booking, travelling, to returning home and even refunding our deposit. 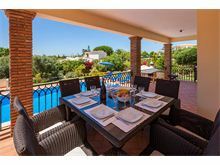 We first used Affinity because it was immediately obvious to us that they only deal with top quality villas and the only difficulty we had was choosing which one! 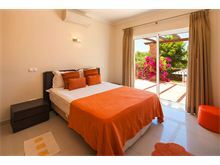 Beautiful gardens, fantastic pool, great barbeque, very well equipped and luxurious villa, shall I go on? Thank you Affinity Villas for once again helping with a 5 star family holiday, we look forward to booking with you again. 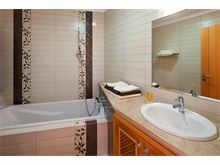 Fantastic accommodation in an excellent location. Already planning to go back! The whole process with Affinity Villas was extremely efficient and responsive so we could just relax and enjoy our holiday. 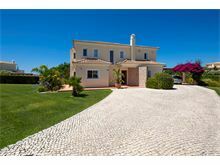 Excellent villa, nice views & spacious grounds, 20-25 min walk from Carvoeiro centre and beach. Fantastic villa with plenty of space. Pool was large and many a lazy day was spent around it. Town is about a 25 minute walk away to get down to the beach, but bars and restaurants started about a 15 minute walk. The villa was amazing just as the pictures online. Very well equipped and the pool and garden were very well kept and looked lovely. 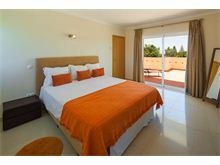 A beautiful setting and about 20 mins walk from Carvoeiro restaurants. Apart from that we couldn't have chosen better. Maid service very good too. Fabulous villa, even better than the photographs. Totally blown away by the villa, pool area and grounds. Bedrooms all large as is the kitchen with everything you require. Unfortunately due to poor weather we didn't use the BBQ which was a disappointment as this is also a great asset. 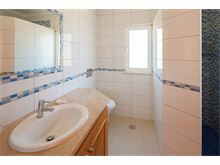 Villa is located in a small cul-de-sac with electric gates so very private. Hope to return one day. 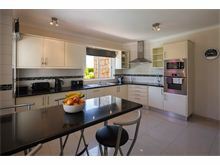 Good villa on nice plot with good sized pool. 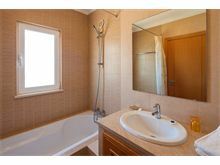 Clean and well appointed with four nice bedrooms and three bathrooms. Aircon was a benefit. Villa was lovely and in a fabulous spot.